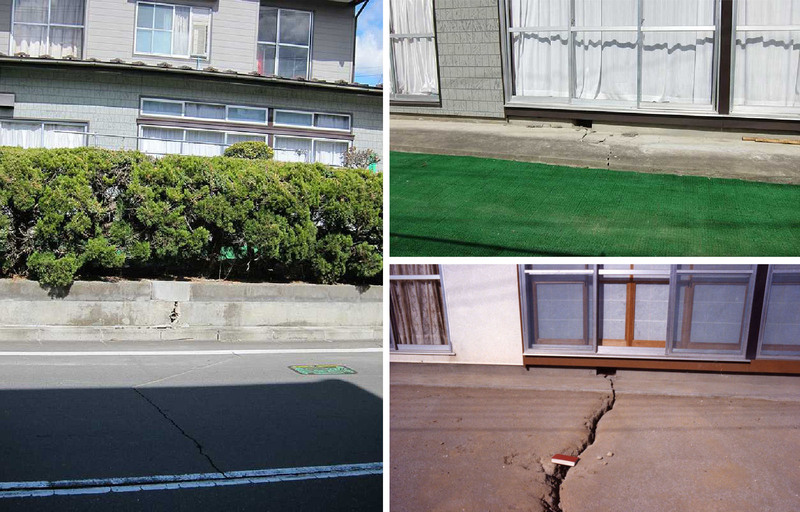 Structural damages to housing in Sendai City, the largest city in Tohoku Region, occurred in particular areas: on artificially modified hills. In order to meet the rapidly growing housing demand of the previous decades, housing estates have been developed on suburban hills through extensive artificial landscape modification. Hills were chosen for housing development since the plains were already urbanized or occupied by agricultural lands that are protected by planning, while suburban hills previously used as common forest or for making charcoal lost its role in the modern city (Isoda et al, 1998). Hills are typically modified by cutting the ridges and filling the valleys, thereby creating a flat terrain with least transport of soil. 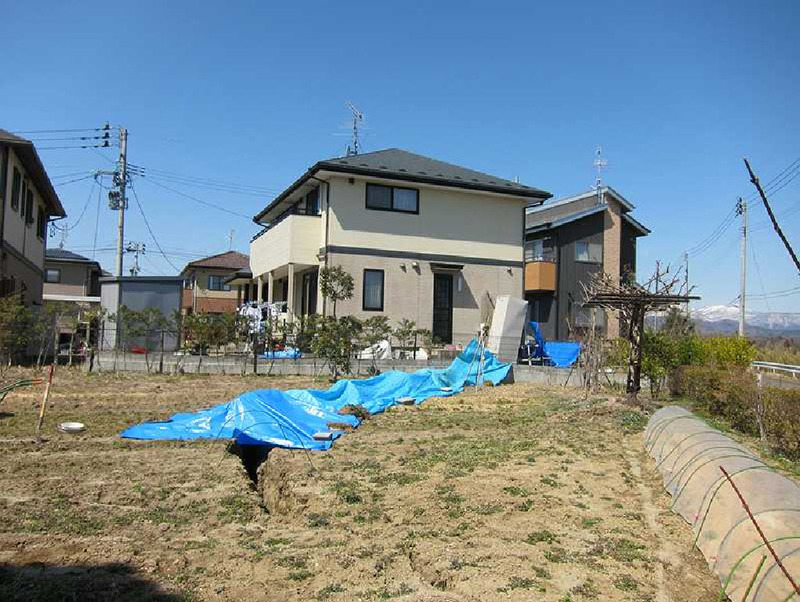 Most heavily affected houses are often located on the boundary between land cut and fill or on the land filled sites. 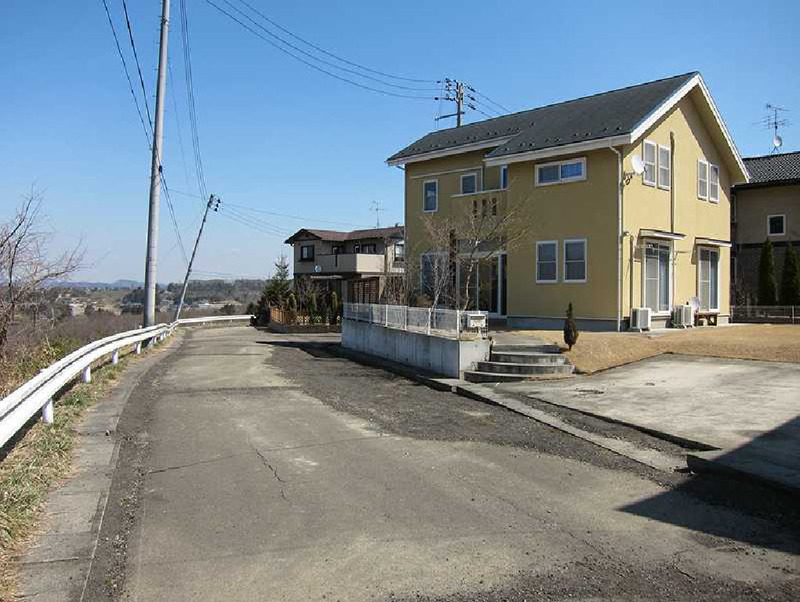 The damages on houses on artificially modified hills were also prevalent in previous earthquake in this area, 1978 Miyagi Earthquake, and there is a close relationship between damage occurrence and artificial landscape modification (Murayama, 1980; 1998). 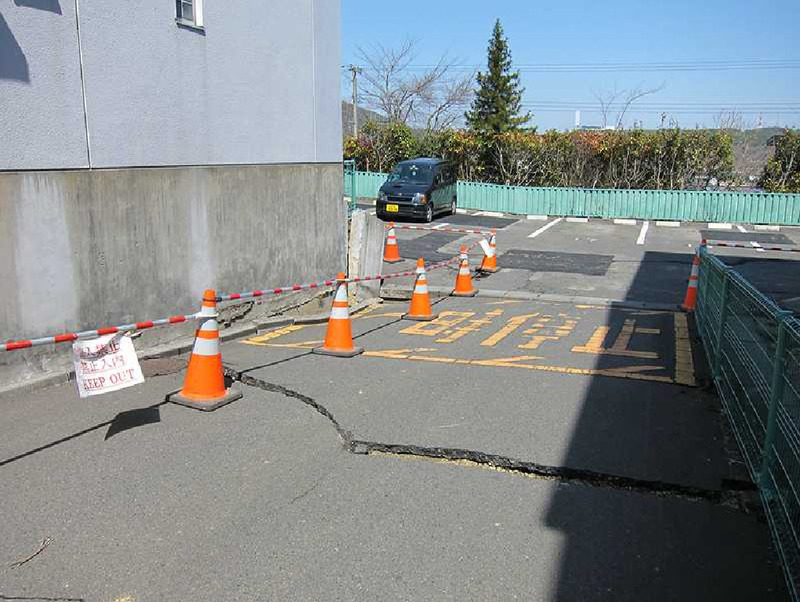 The following is an early result of the preliminary fieldworks conducted as part of the planned Structural Damage Survey of the Architectural Institute of Japan (Tohoku Division). 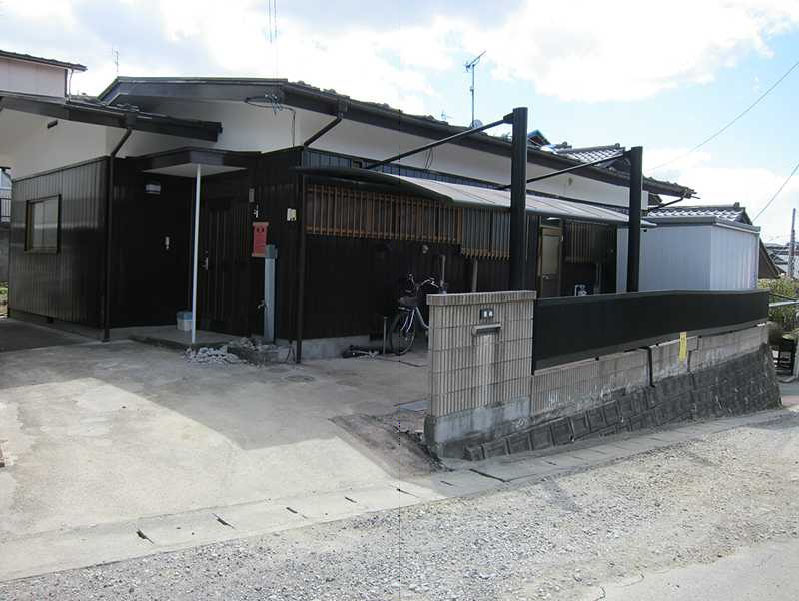 Fieldwork were conducted at Takanohara (Aoba Ward), Oritate (Aoba Ward), Nankodai (Izumi Ward), Kuromatsu (Izumi Ward) and Tsurugaya areas (Miyagino Ward) on 1-4 April 2011. 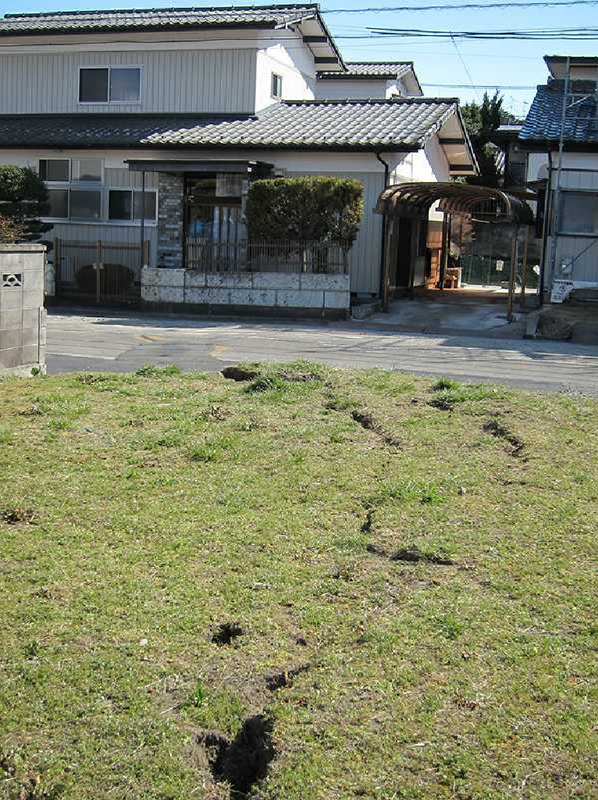 The northern part of Takanohara 2 is probably a mounted area, and ruptures run on land and subsidence of houses is occurring near the slope at the northern edge. All of the following locations are assumed to be on landfilled valley and on top of the slope. Photo 2(d). Large rupture, the apartment itself is probably not damaged. Photo 2(e). 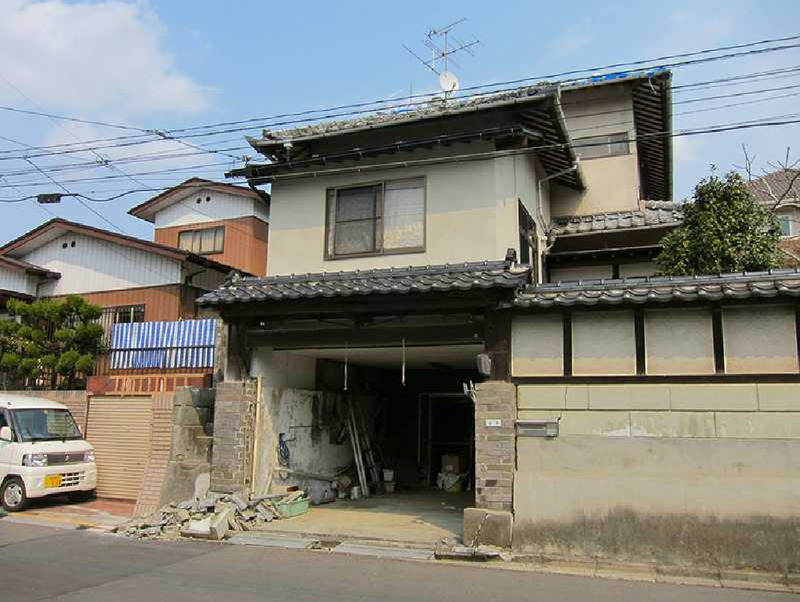 Subsidence on land and the house is tilted. 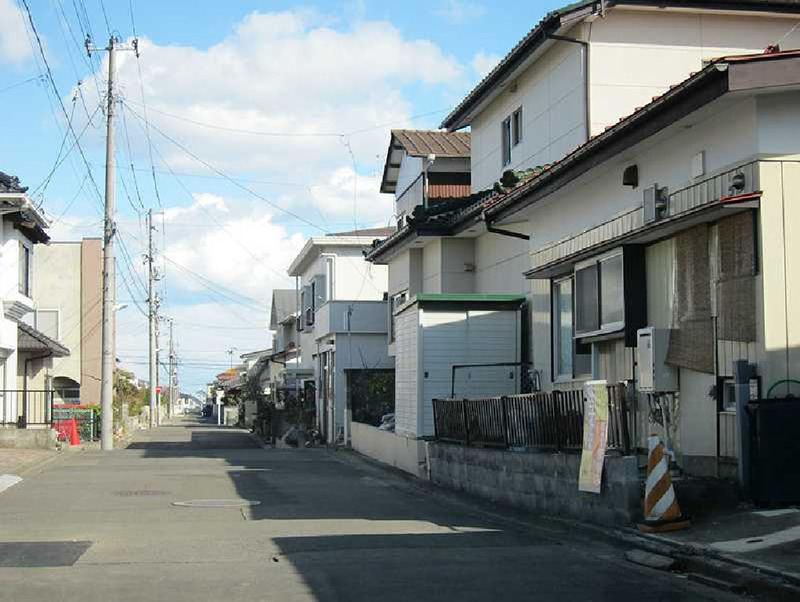 Nankodai was one of the most severely damaged area from 1978 Miyagi Earthquake. At that time, land filled areas and especially the boundary between the fill and cut were heavily damaged. Similar damages can be found for this earthquake including cases more severe than 1978. 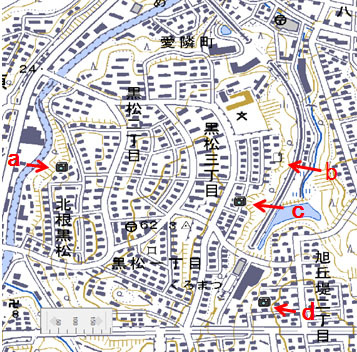 Fig 3 Map of Nankodai and locations of Photos 3(f)-(i). Similarly to 1978 Earthquake, damages are observed on top of the slope of the mounted section around the artificially created terrace. Figure 4. Map of Kuromatsu and locations of Photos 4(a)-(d). Photo 4(a). Rupture in walls, foundation probably damaged. Buried pipe in front of the house has been already fixed. Similarly to 1978 Earthquake, damages are prevalent on boundaries between land cut and fill. Figure 5. 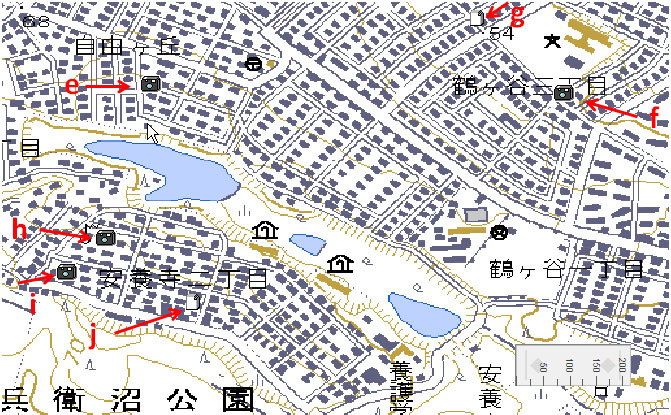 Map of Tsurugaya area and locations of Photos 5(e)-(h). Photo 5(h). Rupture on land on boundary of land cut and fill, left side is the filled section. Wall deformed, road and buried pipe been fixed. Housing damage unknown. Photo 5(i). Boundary of land cut and fill across the road, further back is the filled section. Trace of buried pipe being fixed. Photo5(j). Boundary of land cut and fill, the left side is the filled section. Rupture on the road and damage to the wall. 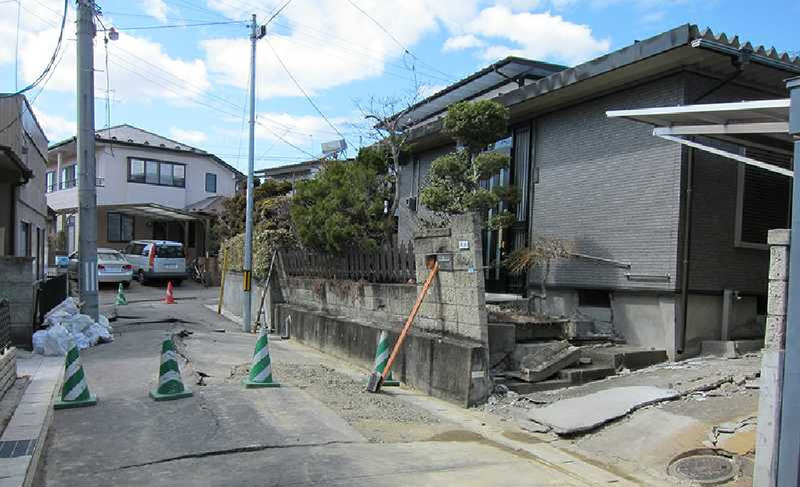 Foundation of the house damaged (close up in the right photo). 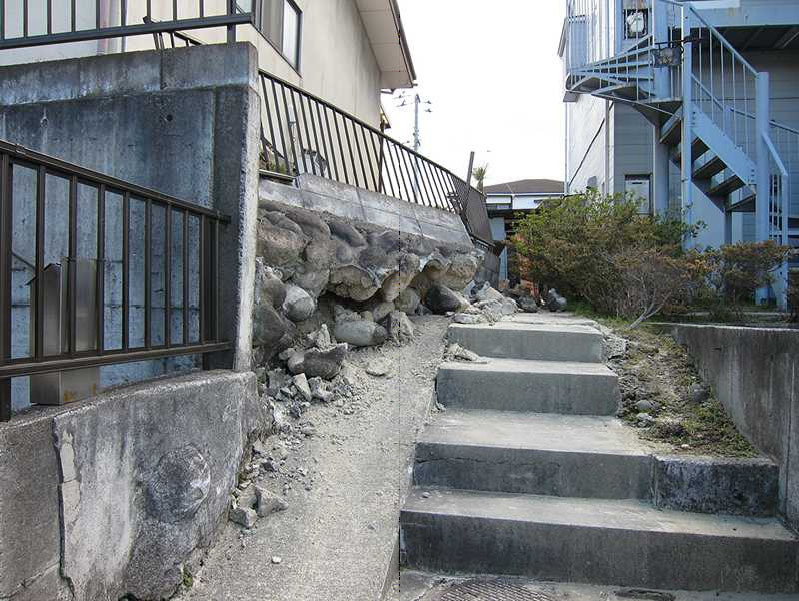 The damages from the tsunami are much reported in the 2011 Earthquake, and lowlands certainly have greater hazards to tsunami, ground shaking and of liquefaction. However, upland areas also have different types of hazards. Structural damages similar to those reported here is widespread and because of higher density of population on such land, number of households having such damage can be very large. 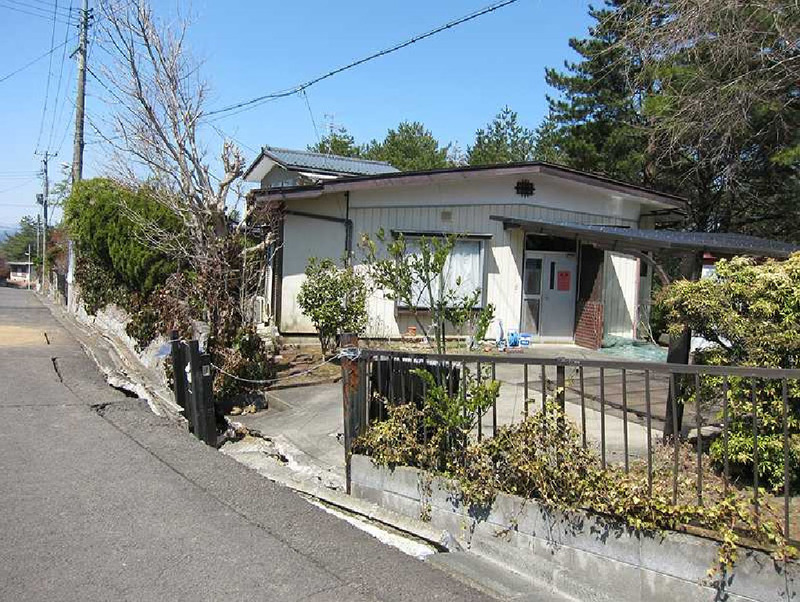 Furthermore, the situation that residential estates are created on artificially modified landscape is not limited to Sendai but applies to most of largest cities in Japan. More detailed survey for many areas is necessary. 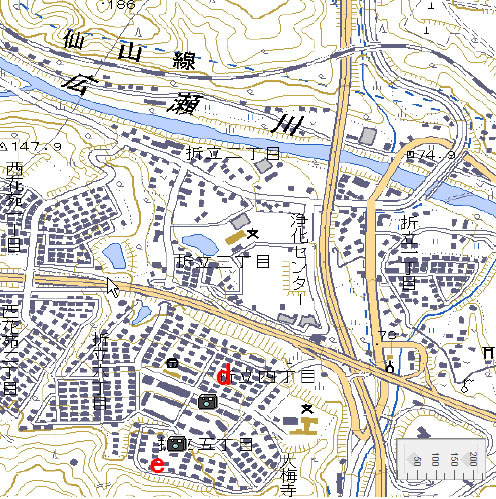 The maps in this report used Kashmir software with digital image of topography from Watchizu provided Geospatial Information Authority of Japan (URL: http://watchizu.gsi.go.jp/ A part of this report is also reported to Disaster Emergency ). 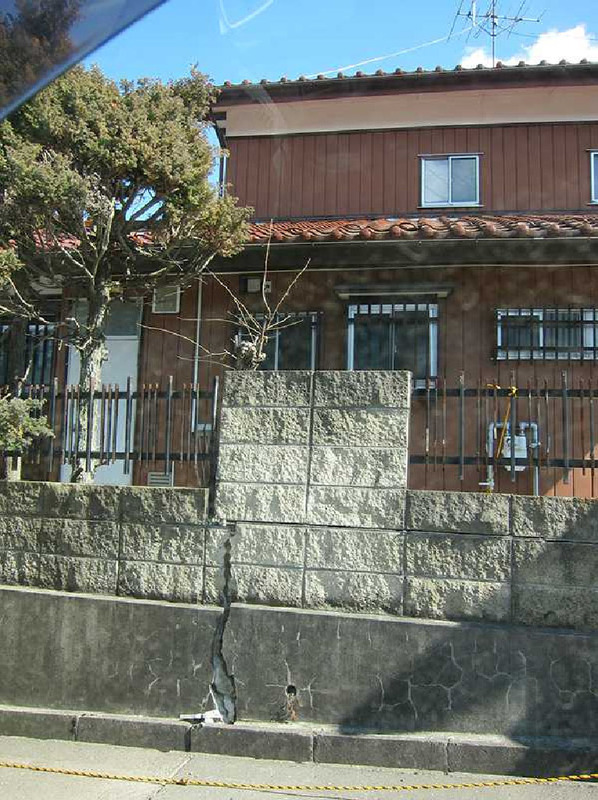 A part of this report also appeared in Disaster Emergency Report page of the Association of Japanese Geographers. (URL: http://www.ajg.or.jp/disaster/201103_Tohoku-eq.html). 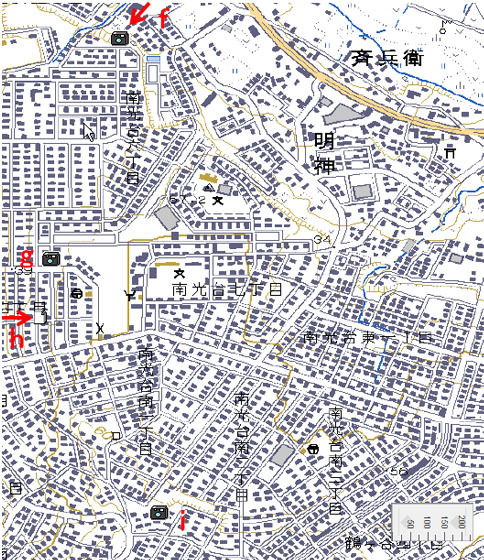 Isoda Y, Kim DC, Matsuoka K (1998) ‘The Geography of the Changes in Agricultural Land Use in the Sendai Metropolitan Area, Japan: an Examination of the Topographic Characteristics using the Geographical Information System’, Science Reports of the Tohoku University 7th Ser. (Geography) 48, pp35-64. Murayama, Y. (1980) ‘Damage of residential area in Sendai and its vicinity caused by the Miyagi-ken-oki Earthquake’. Annals of the Tohoku Geographical Association, 32, pp1-10 (in Japanese). Murayama, Y. 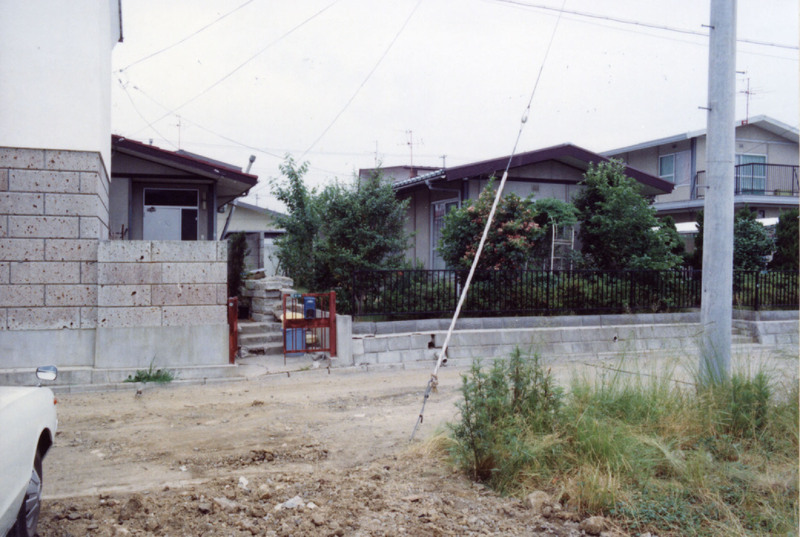 (1998) ‘Housing Estates Developments and Earthquake Hazards: Some Recent Cases in Japan’, Journal of the Korean Geographical Society 33: 739-744. Murayama Y, Kumaki Y (2008) Study on Evaluation of Ground Conditions of Transformed Land using GIS, JACIA Research Report 2007-05, URL: http://www.jacic.or.jp/kenkyu/10/10-05.pdf (in Japanese).